Warning. This is a very green entry. 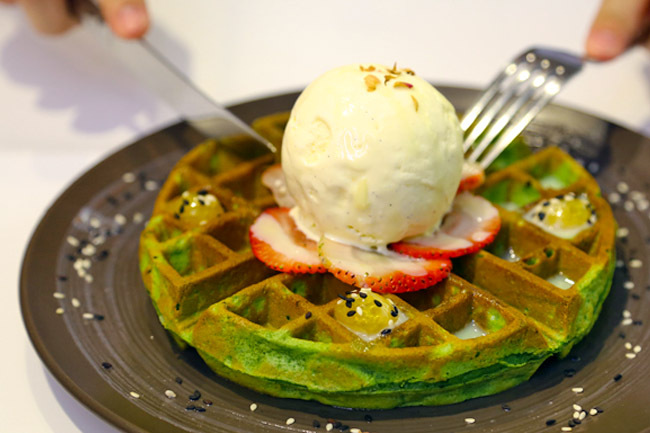 Matcha, the finely ground green tea powder, has landed to be IT ingredient in so many desserts from cakes, ice cream to waffles. Its elegant emerald green colour, subtle bitterness to sweet desserts, and perceived health qualities (anti-oxidants, anti-aging!) makes it irresistible yet somewhat mysterious. 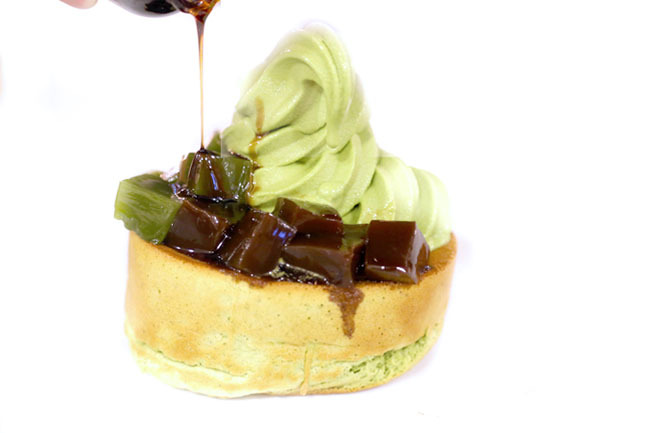 Wa’s Matcha and Ogura Shibuya Toast ($17.80) is dazzling. Opps. 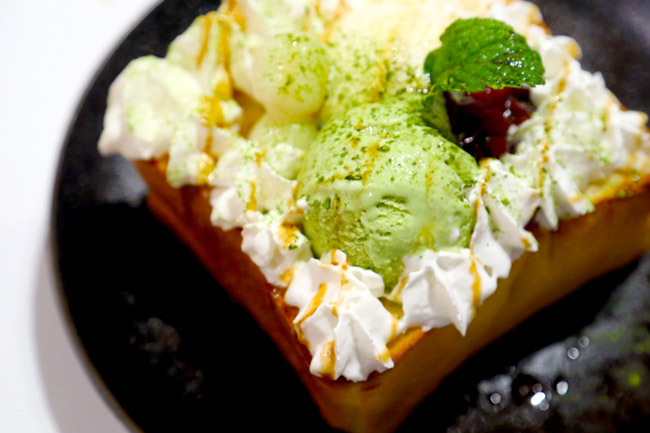 The honey toast was thick yet fluffy, topped with smooth matcha and vanilla ice cream, mocha and ogura Japanese red bean. Absolutely satisfying, recommended 2 or more to share. One of my favourite (and hidden) Japanese café in Singapore. 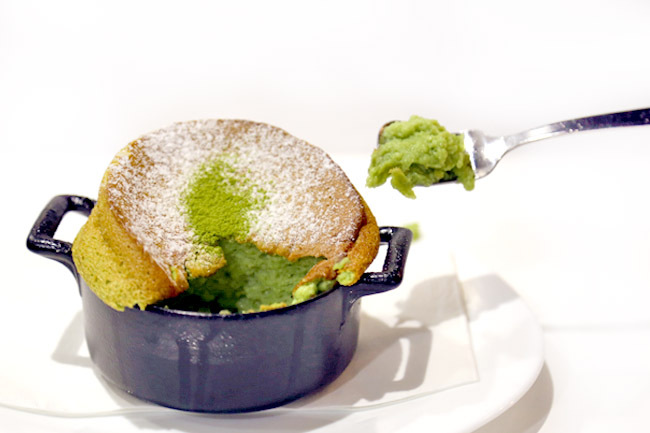 This Japanese-French style soufflé is oven-baked only when ordered. Do leave a 20 minute waiting time. Quite airy, fluffy, with tinge of bitter matcha aftertaste. Montana’s Strawberry Field Waffles ($9.50) is available in two types of bases: the big crunch which is crispy, and fluffy soufflé with a chiffon-like middle. The fluffy version which is indeed true to its name, is recommended. We liked that there were sweet sour elements of strawberry slices and mango passionfruit spheres balancing out the taste. The froyo trend continues. Nookie’s version 2.0 Matcha Black Sesame Crumble Yogurt ($6.90) with kiwi fruits. The yogurt had base which was sourer than the other famous brand, topped with crunch and bite-able ingredients, like eating dessert in a cup. The matcha sauce could have been more distinct in taste though. 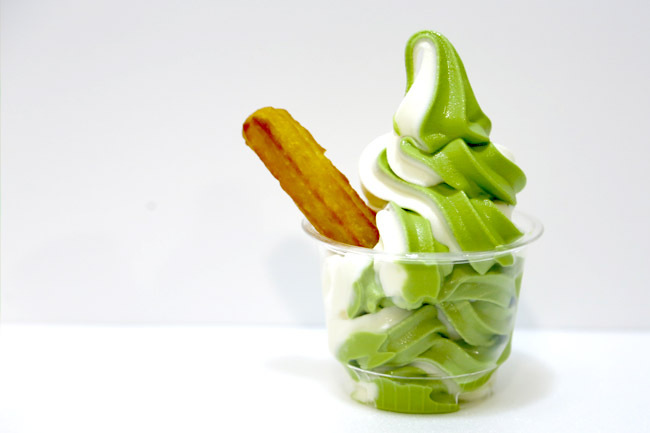 AmaSoy’s newly introduced Matcha Softserve is great value for money at $2.50 per cone for its promotional price. $2.50!!! The texture is milky and smooth, as good as those you would get in Japanese restaurants, matched with a subtle delicate taste of green tea. Also try the new matcha and Hokkaido Milk twist with Churros! Imagine, cold and hot together. Matcha Hokkaido milk drink with delicate silky texture, and Matcha Collagen Pudding where beauty and smoothness, can come in a dessert. You didn’t read wrongly. It is collagen. If you need a thirst quencher, go for Uji Kintoki ($5.80) shaved ice with green tea syrup, or O-maccha Milk Ice Blended ($5.50). The latter one of the most ‘matcha’ of many drinks I had – you can really taste the ‘green-teaness’ and fine distinct quality of the powder in its subtlely. Photogenic much. 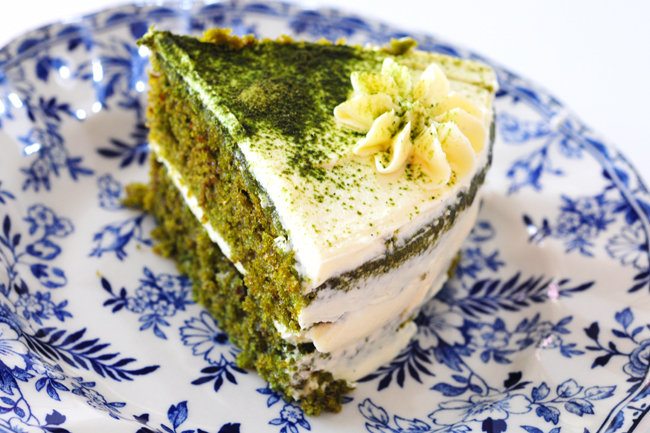 Matcha Cake with Goma ($11.50) which comes served in a Japanese-style bird cage. I hear Dolce Tokyo make them in small quantities daily. We may have seen many green tea azuki cakes versions around, but not quiite green tea black sesame. The best part? 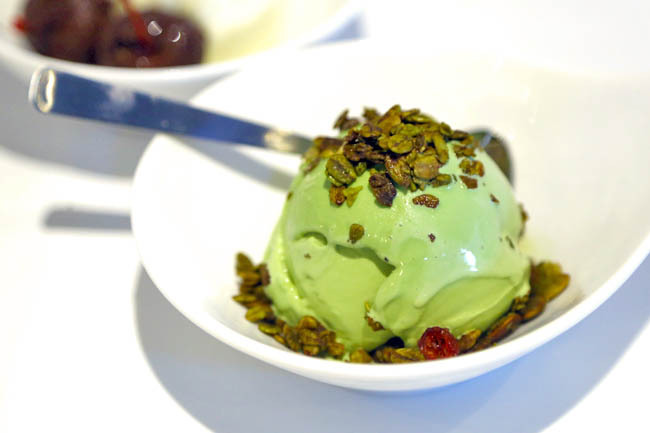 The crunchy green tea crumble on its top layer. Though considered quite expensive. Nana’s Green Tea was once voted as the No. 1 Japanese cafe for matcha lovers (in Japan lah, not here), and had been known as Japanese’s version to Starbucks. 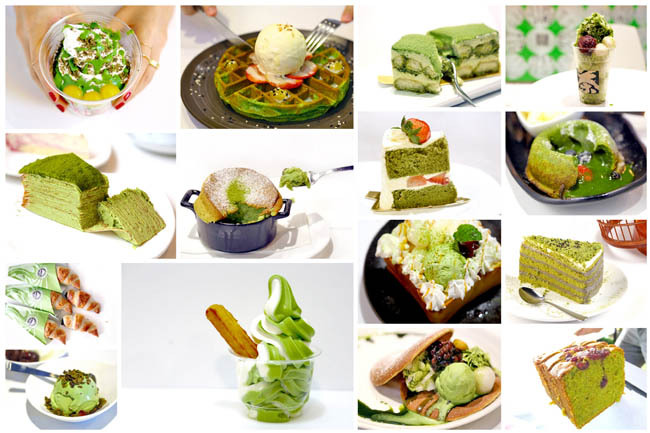 Its desserts such as its Matcha Anmitsu ($8.80) and parfaits are definitely its strength. It may not blow you away but makes a decent afternoon tea-time treat, with its azuki red bean paste smooth and satisfying. Hoshino Coffee is already quite popular in Japan, specialising in hand-dripped coffee and fluffy soufflé pancakes. 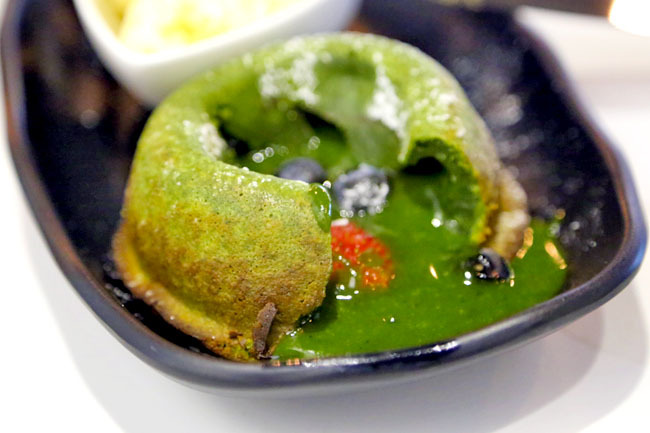 Its signature Pancake Souffle Style with Matcha and Ogura Bean Paste ($13.50) will take long to serve as they are freshly made on the spot, and accordingly their oven can only produce 6 at a single time. Many buy St Marc Café’s Chococro in boxes of 5. 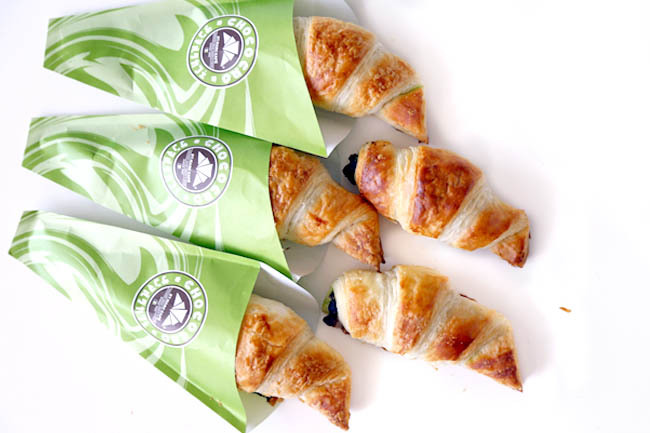 The Matcha Daifuku Chococro ($2.60) is crispy flaky matcha chocolate croissant with mochi and red bean within. Quite super when eaten warm. This is what Doreamon would have loved. 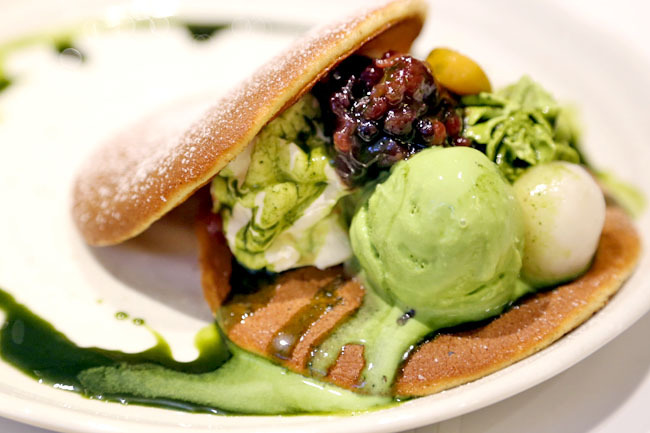 Maccha House serves a larger version of the Maccha Azuki Bean Dorayaki ($8.40). Not overly fantastic reviews for some other items. 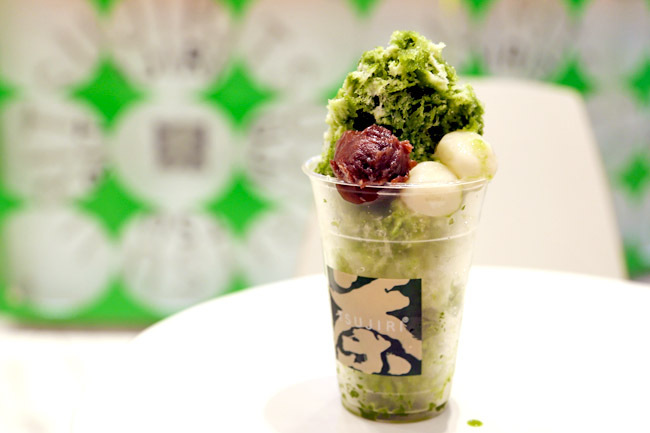 Go for the Maccha Parfaits which come with rice flour, chocolate or soy milk pudding. They even serve the Hot Maccha drink the traditional way – self-concocted out of a bowl. 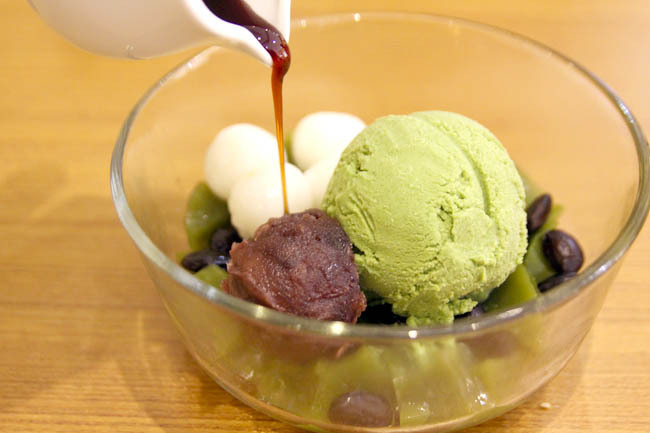 Nunsaram’s bingsu is one of the most photogenic. 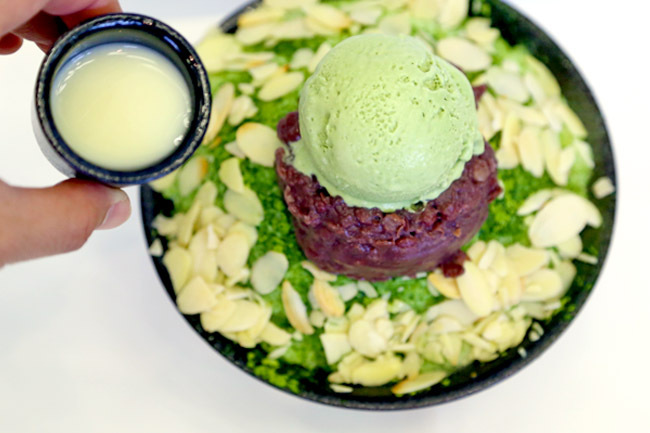 Just look at this Green Tea Bingsu ($13.90) with ice cream, generous scoop of red bean and almond nut slices. The Korean cafe also uses one of those expensive bingsu machines, ensuring snowflake-like shavings, though we felt it was still not as smooth as some of the prominent ones. Opened by Tampopo Group, Dulcet & Studio is a self-service café which cooking studio at one end. So cakes are of a certain quality. 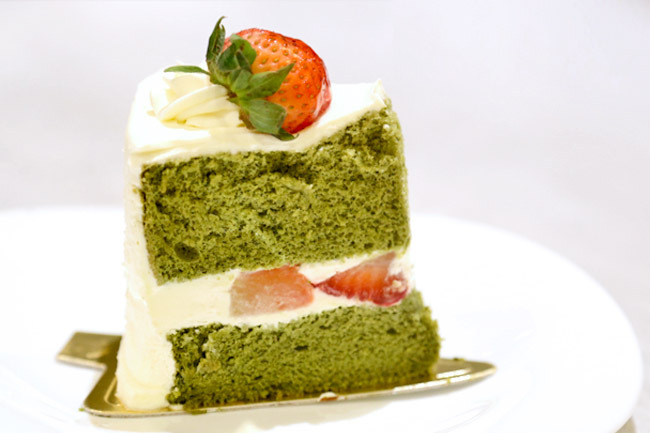 The café has quite a range of matcha desserts from éclairs, puddings to this rather creamy chiffon cake ($7). Truth-to-told, I am not that a fan of tiramisu. But one spoonful, one spoonful of that very moist cake sponge, creamy mascarpone and a slight explosion of Liberty’s expresso and liqueur with Marsala wine got me almost in cloud nine. Matcha Lava ($12) green tea infused cake is one of the few cakes I had that both tasted and smelled ‘matcha’, almost brilliant, but perhaps overpowered by the over-sweet white chocolate fondant. 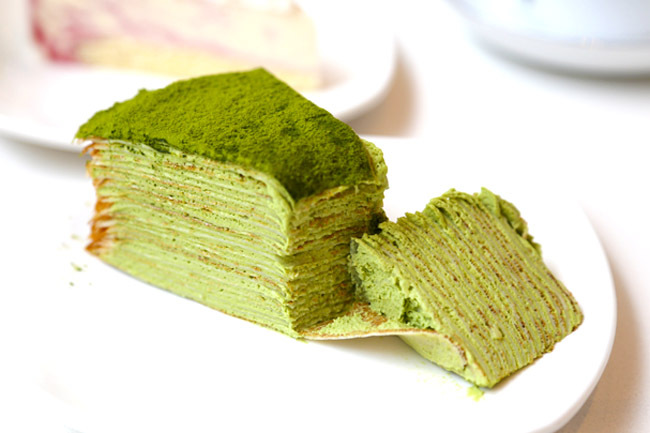 Green Tea Mille Crepe ($9/slice) where the sweetness of the pastry cream wedded the subtlety of the fine green tea powder. You can choose either to peel layer by layer, or take a bite of its entirety. My method is the former. Nicher is such an understated stall. 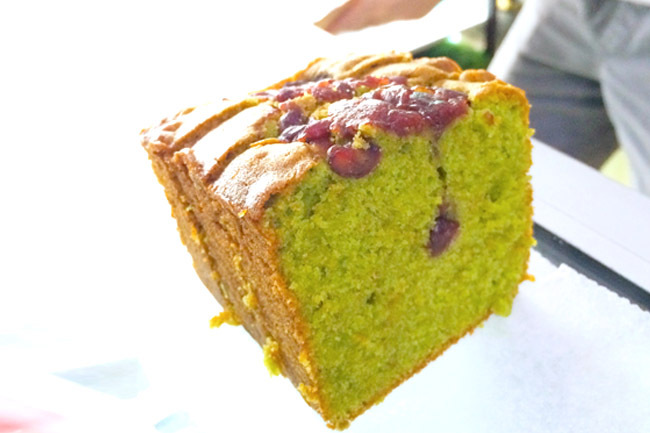 Its Matcha Azuki Pound Cake ($14) with whole Hokkaido azuki beans is quality stuff, robust in green tea flavour, best paired with a cup of hot tea. Note: Always sold out early (say late afternoon). Frozen custard, not exactly ice cream. Prices were $4 for single scoop, $7 for double, $9.50 for triple, and $9 for a two scoop sundae with 2 toppings and sauce. The texture was true to its name ‘denser’, smooth and creamy, won’t feel like there is air or ice crystals ‘trapped’ within. It reminded me of a velvety version of thickened gelato. The matcha flavour though, is not available all the time. L’Atelier Tiramisu is closed or no longer at The Central at Clarke Quay. Just passed by last week and the shop was hoarded up. Hi KS, they are still around! Doing their renovations now, will add in the note. Thanks! Can consider updating the list. Eg. Matcha tart from cupplets and the matcha sponge cake from Sunday folks. 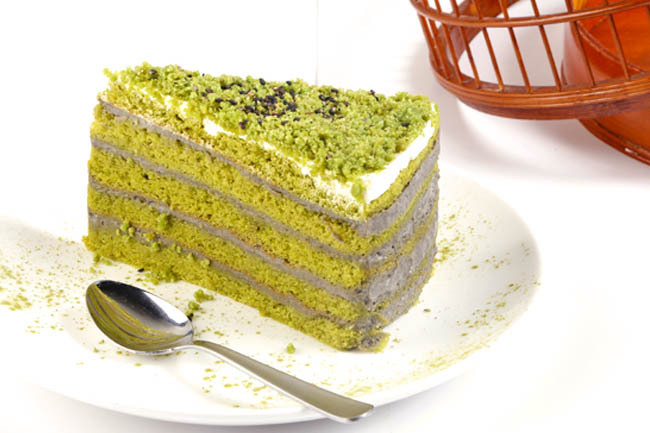 Hey, your description for Latelier’s matcha tiramisu is incorrect. Espresso and marsala wine is for the original flavour. 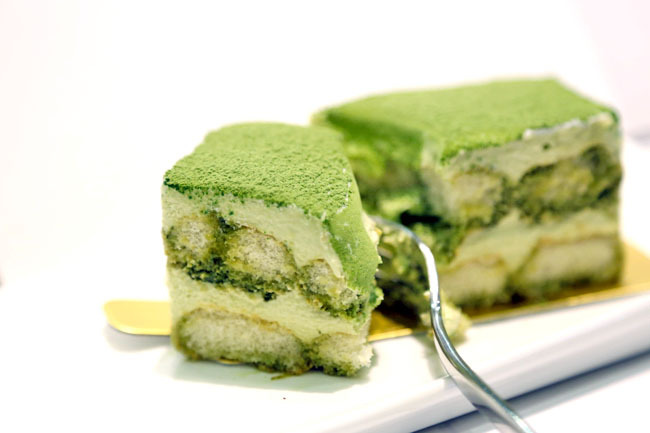 Matcha flavour is with rum and white chocolate shavings in between the layers. Anyway, the cafe is now getting beans from Common Man roasters, so the original flavour (espresso + kahlua + marsala) tastes even better!